For young and modern brides-to-be, many find themselves to learn about Si Dian Jin for the first time, unsure about the symbolism and tradition behind this wedding custom. We've heard your questions and have decided to answer them with a guide on all you need to know about Si Dian Jin 四点金, and perhaps even dispel the generalisation that Si Dian Jin 四点金 is "old fashioned" or unsuitable for daily wear after your big day. Si Dian Jin 四点金 is a traditional custom that is commonly practiced by the Chinese. Translated as "4 touches of gold", a 4-piece set of wedding jewellery usually consisting of a necklace, a ring, a bangle and a pair of earrings is presented to the bride as a betrothal gift by the groom’s mother. The origins of this custom surfaced from the olden times, where houses in the Teochew provinces had 4 curved rooftops that looked like the umbrella shaped mandarin character “Jin”. When a mother-in-law gives her daughter-in-law Si Dian Jin 四点金, it suggests to the daughter-to-be that she will always have a roof (or rather 4 roofs) over her head. The wedding jewellery symbolises a welcome into the family, and is a way of saying that the bride will always be taken care of. 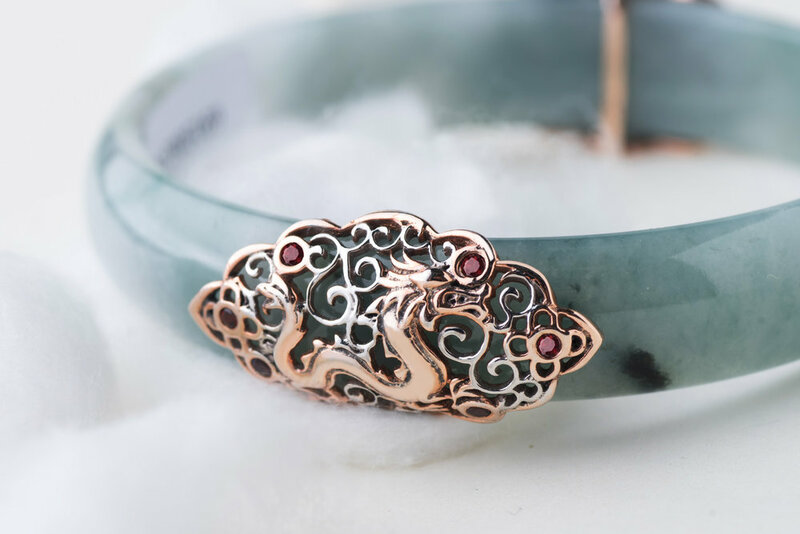 Most Teochew families continue to practice the custom of Si Dian Jin 四点金 with a complete set of all four items, while the Cantonese and Hokkien dialect groups place more importance on a pair of bangles - one with a dragon motif and one with a phoenix motif. This symbolises harmony and all-roundedness. It is believed that the dragon and phoenix provide strength and balance in relationships, bringing to the newly weds a new chapter of everlasting love and fulfilment. 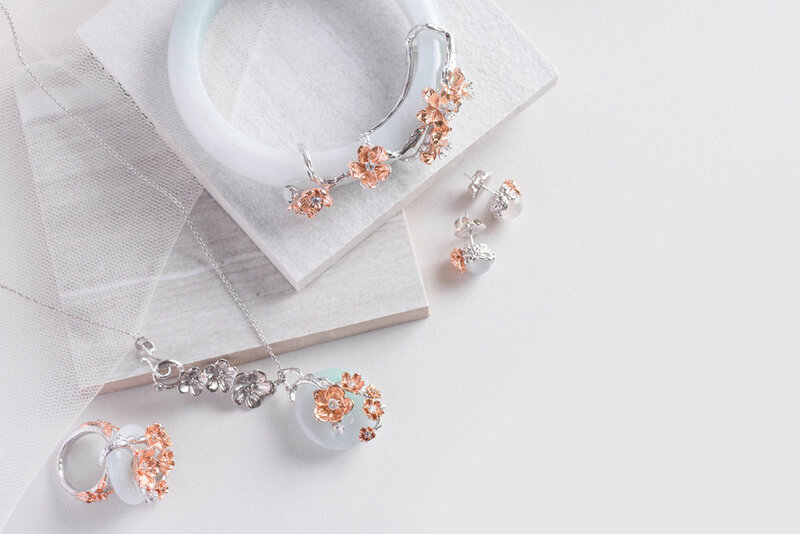 Choo Yilin Hydrangea Si Dian Jin Set in 9kt Solid Gold. Solid Gold has always been the preferred choice for older generations for its monetary value. However today, the tradition makes way for gold plated or silver bridal jewellery. Jade has also been a go-to option for its strong heritage and timeless look. Depending on each family's rootedness in tradition, the Si Dian Jin 四点金 custom may still be followed through tightly, ensuring that the jewellery comes as a set in solid gold, or be taken more lightly and more as a touch of tradition, with more flexibility in mixing and matching jewellery to the brides' preference. 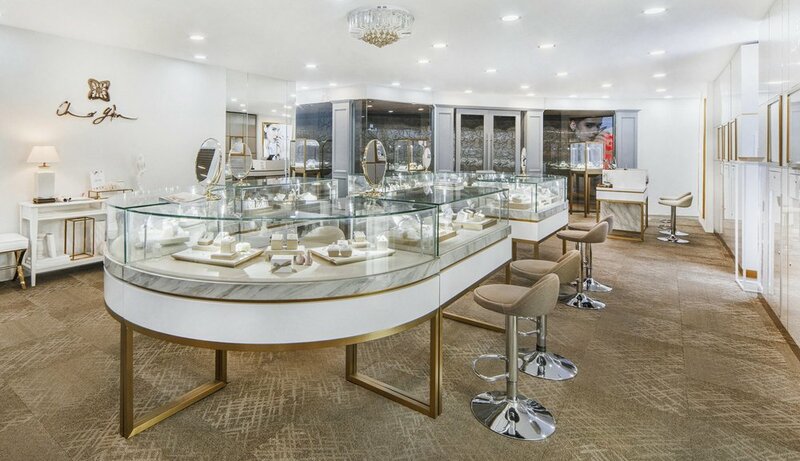 Today, many modern in-laws prefer to bring their daughters to be out shopping to choose the wedding jewellery they want as well. Prices of a Si Dian Jin 四点金 set can range from S$10,000 onwards depending on design, which is why it is important for both families to have similar expectations when it comes to the Si Dian Jin 四点金 custom. As Si Dian Jin 四点金 was typically given in solid yellow gold in the past, many young brides hold the view of Si Dian Jin 四点金 being merely a custom, finding it hard to appreciate the jewellery or wear them again even after their big day. However, there are many modern options available today. 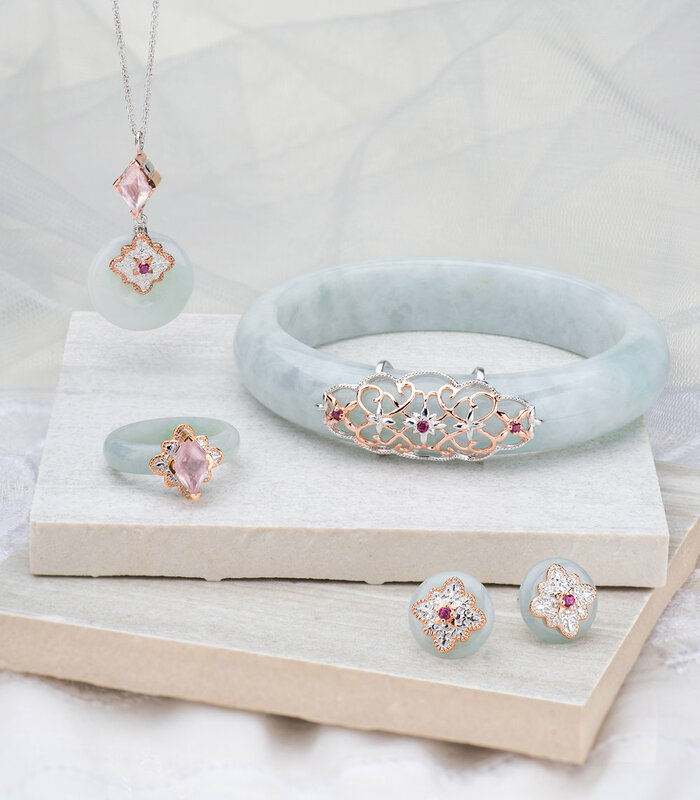 From classic Jade designs with intricate motifs of Asian heritage to timeless white gold pieces, modern wedding jewellery should be loved and cherished, and even be worn for countless occasions to come after your big day. It is also common for the modern bride not to stick with the 4 pieces of different jewellery, deciding to have two necklaces or two rings instead, or even just purchasing one piece of jewellery that is of a higher value. Is The Si Dian Jin 四点金 Custom Important for my Wedding? We hope you've gained some insights into what Si Dian Jin 四点金 is all about! Depending on your heritage, the custom of Si Dian Jin 四点金 may hold more importance than others. There is also no fixed rule or superstition involved should the couples choose to not practice the custom. However, Si Dian Jin 四点金 may be a lovely way to add a touch of tradition to the biggest day of your life. 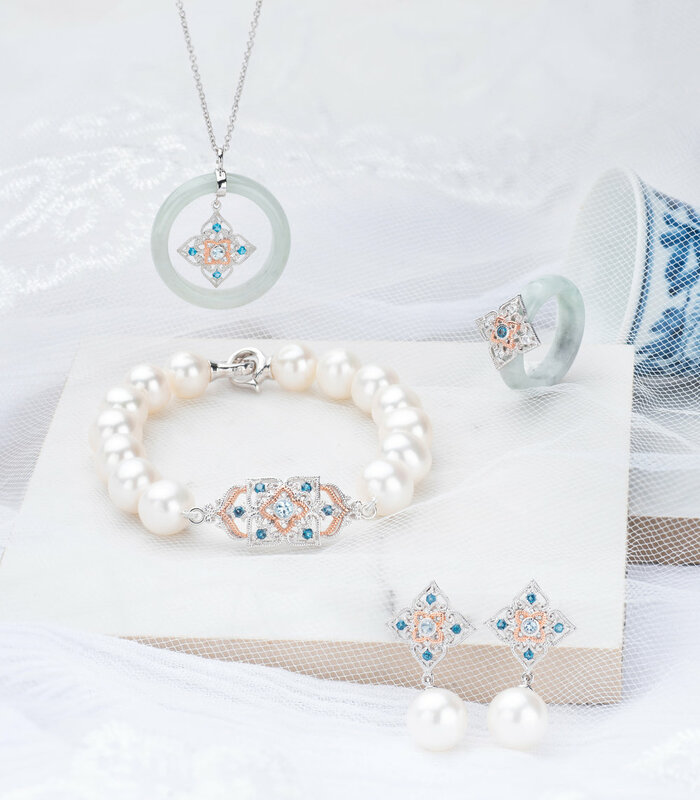 Bringing a part of your cultural roots to the next step of your life and having these jewellery pieces to treasure for a lifetime can be an amazing way to keep these memories, perhaps even passing them down to your children and your children's children, holding stories that can be told from generation to generation. 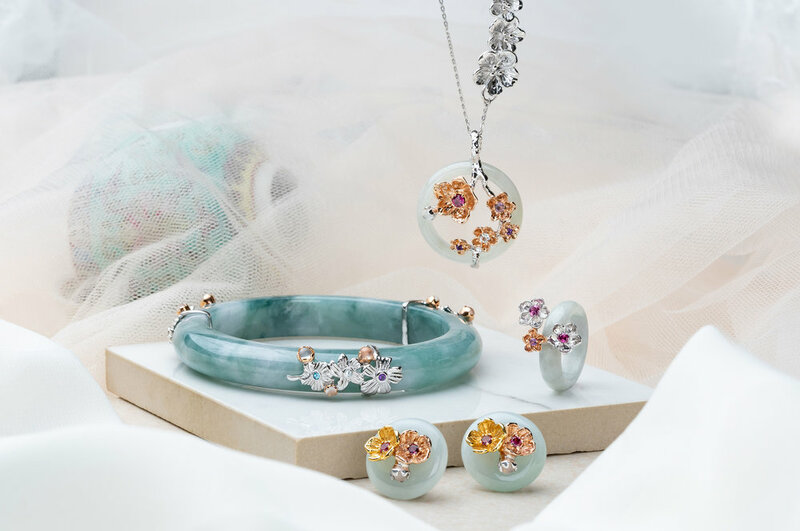 View our full Si Dian Jin 四点金 collections here, or make an appointment at our flagship boutique at Mandarin Gallery to customise your very own one-of-a-kind set.